Unlike other dog groomers, I chose to go far beyond what most groomers do to become one of the best in my industry – yet my rates are very competitive so you can afford the best for your dog. 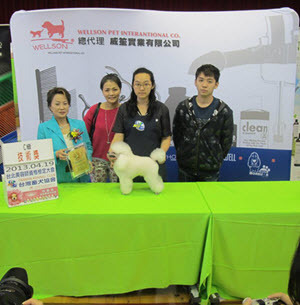 I got certified as a dog groomer in Taiwan (where standards and expectations are very high.) Note my English is perfect. 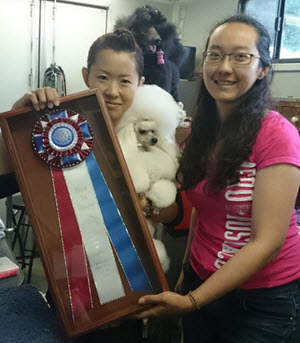 Next I invested in mentoring from two of the leading dog groomers and handlers in the USA including 30 year veteran master groomer Maggie Donnalley and world renowned Kaz Hosaka. You see, I wanted to offer the highest standard of grooming available in New Westminster & Burnaby for pets and show grooming. Because I have groomed almost every breed, have the experience, high level formal training, certification and mentored closely under two of the best groomers and dog handlers in North America, I have the confidence to offer you my 100% satisfaction guarantee – details to the right. I recognize and have mastered dozens of styling options. Although I always adhere to breed standards when grooming, sometimes that isn’t feasible for you or your dog. Whether your dog is a champion conformation winner or a beloved family pet, my well balanced, stylish and impeccable finish will always leave your beloved dog looking great! Learning to understand and interpret the correct breed standard style and personality of your pet is critical to me capturing the proper essence of their breed and the uniqueness of your pet. My clients tell me I am naturally gifted in this field and regardless of how near or far they are, my clients are happy to drive to my New Westminster dog salon from New Westminster, Vancouver, North Vancouver, West Vancouver and beyond for their dog. To me, washing and grooming your pet is a skillful, loving art – NOT a job. All dogs deserve this loving caring mindset and a stress-free grooming environment. That’s why I NEVER double book or kennel your dog. They deserve the same level of love, care and peace of mind from me, that you give them. 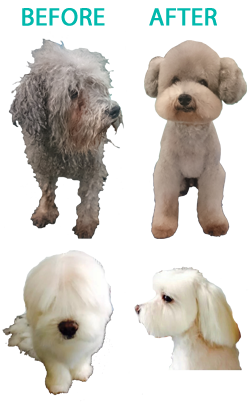 I am confident the combination of my high standard of excellence, use of top quality dog grooming tools and products and years of experience will give your pet WOW looks both you and others will admire. and check my availability for your dogs grooming appointment. I look forward to meeting you both soon! If you want, you can see my certification certificate and business license here.